EPIC | Oh Look! It's A Blog! Finally back with a fashion type post – sorry once again for my absence, I have had RL things that have just kept me from being around as much. A cutesy style post today though using some stuff from several different events. I also plan to blog the cage in the background in the future, but I thought it made for a nice background prop for this photo. You can pick up this cute dress I am wearing from *EPIC* at The Manga Fair – it is open until the 30th of this month. Skin Fair 2014 is comingggggggggggggggg. It will open to the public on March 14th and run until March 30th. This event fills 3 entire sims with TONS of great skin brands as well as make-up stores bringing all sorts of new releases. My post today is on the new Romy skin from Glam Affair. I did the above shot using several add ons based on how I wanted to “build” my face. This skin comes with a TON of add-on options so you can customize it to your liking – from your brows to your lips/nose everything has mix and match options. Each lip type has 10 lipstick colors and the noses are available in 5 add on’s plus the nose that comes default on the base skin. The base nose did suit my shape the best with this skin and that is shown in the large photo above to the left. In addition to noses and lips Romy is offered in 7 skin tones ( this is a FULL line release!) so whatever tone you prefer, including the newest Asia tone – Romy is available in them all – (Artic Europa Asia America Jamaica India Africa). 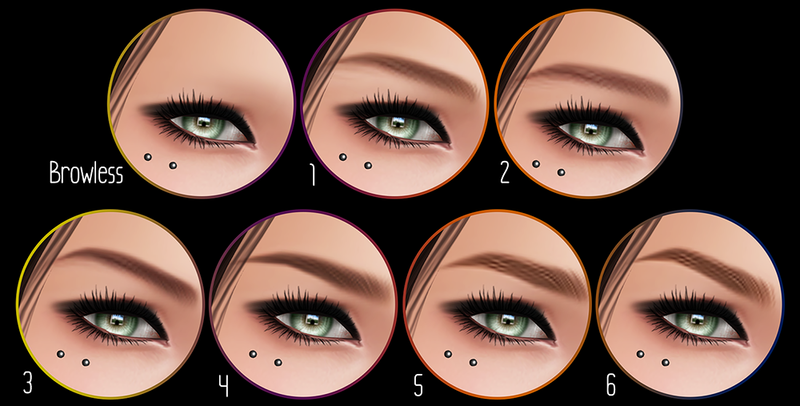 Each eyebrow type is available in 8 tones ( A-H) per type. * Eye makeup options – A color line, dark line and light line each with 6 make-ups per line. *I am using one of the “dark line” options in most of the photos. * Lip Glosses – 6 different variations. * Cheek Options – 5 different variations ( from a light blush to skin highlights ). * Freckles & Moles – 9 different options! I will be blogging several other skins that will be available but I am slowwww with skin posts so bear with me! For more information on Skin Fair 2014 please refer HERE to the official blog!